earn her third shut out of the season. 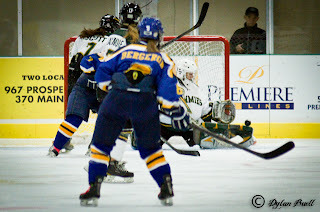 The Lady Tommies were in Moncton this afternoon to close out the first half of the 2012-13 regular season. On the strength of a Julia Sharun shut out and three points by Captain Kayla Blackmore, St Thomas cruised to a 4 to 0 victory over U de M.
After missing last game due to academic commitments, Blackmore got STU rolling early in the first as she buried one by Jenna Van Belois at 2:54 unassisted. Kayla would add to STU's lead at 12:15, again unassisted, with her eighth goal of the season. Shots were 13 to 9 in the first. St. Thomas would go ahead by three goals early in the middle frame when Blackmore feathered a great pass to Jordie Miller, who would complete the pretty give and go 2 on 1 at 1:24. Kelty Apperson gained the second assist. STU would come close when Cassidy McTaggart rang one off the goal post late in the period but would have to settle for a three goal lead and out shooting Moncton 9 to 5 in the second. STU ran into a little bit a penalty trouble early in the third and leaned heavily on Sharun in net to make some saves as Moncton outshot the Tommies 14 to 5 in the period. The Tommies would put this one to bed at 12:15, as Dani Miller scored the third unassisted marker of the afternoon and STU's fourth of the game. That was more than enough as Julia Sharun collected her third shut out of the season. Emily Ryan, Kenya Marcelline, and Erin MacIsaac were all scratches for today's game. With the win the Tommies sit firmly in second position with a 9 - 2 - 1 record, 19 points, and 7 points ahead of third place U de M.
We would like to take this opportunity to wish the Lady Tommies the best of luck on their exams before Christmas and hope the break is beneficial to our injured players.